Taste: The combination of banana, espresso, and chocolate is a morning dream! Texture: Ultra tender, moist, and gooey. Ease: Super easy, made in less than an hour! Pros: Some of the tastiest muffins I’ve ever enjoyed. Would I make this again? I’ve been making this recipe for over 7 years! 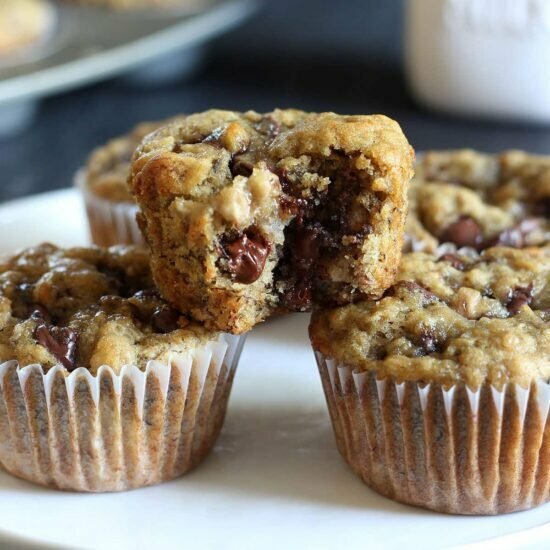 I originally published this Banana Espresso Chocolate Chip Muffins recipe in 2009. Just a few weeks after I graduated high school. That is craziness!!! I remember living in my first place and my roommates thinking I was absolutely insane for taking photos of the muffins I had just made. “Food blogging” wasn’t really a thing yet and I had no idea what I was doing in any aspect of life. Now, 7 years later, my blog is my full-time business. I’ve graduated from university AND culinary school. I’ve published a cookbook. We bought a house. We have two adorable dogs. It’s pretty crazy how much things can change in what feels like a simultaneously short but also long amount of time. Throughout all those changes one thing has remained the same… this is one of our all-time favorite muffin recipes! And I’ve realized I don’t make them nearly enough. Also, the photos I took for these muffins 7 years ago were HIDEOUS. So new photos and a reminder of how good this recipe tastes was definitely in order. You can pick up espresso powder online, or in the coffee aisle of some grocery stores. It’s the perfect way to add lots of bold coffee flavor in a pinch. I always keep some on hand because a small amount of espresso flavor also simply enhances the flavor of chocolate in many recipes. If you can’t get your hands on espresso powder, you can substitute instant coffee powder. Use dark roast if you can and you may need to increase the amount to match the intensity of espresso powder. Preheat the oven to 350 degrees. Spray a 12-cup muffin pan with nonstick cooking spray. In a medium bowl, stir together the bananas, sugars, butter, milk, and egg. In another medium bowl, whisk together the flour, instant espresso powder, baking soda, and salt. Make a well in the middle of the dry ingredients. Pour the wet ingredients into the well and stir until just combined. Fold in the chocolate chips. Fill each cup about three-quarters full. Bake in the center of the oven for 20 to 25 minutes, until a toothpick inserted in the center of a muffin comes out clean. Wow, they look so moist. I love chocolate banana muffins. I make them on an almost weekly basis. I will have to try this recipe out soon. Thanks for your comment on my blog. I, too, love receiving them. Maybe too much. 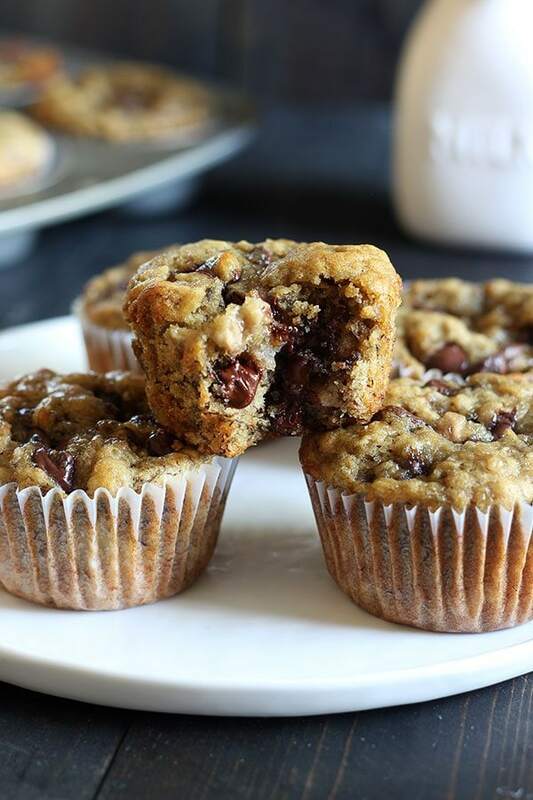 These muffins look so delicious and it seems like I am ALWAYS trying to use up some mushy bananas. Hahaha comments make me happy. I feel like my bananas go ripe way too quickly. This recipe is perfect for that. Now if only I could find a recipe that utilizes not so fresh berries! You’re welcome! Its super cute, I love your photography and the simplicity. This looks amazing, Tessa! I am definitely going to try this! Thank you! Yay I’m glad to hear you’re going to try it 🙂 Let me know how it goes! I’m for sure trying these out today with a friend. They look great. I was wondering have you ever tried making scones? I have been looking for unique recipes but come up with boring ones, suggestions? Yay!! I hope you and your friend like them! Actually, I've never tried making scones before. I saw Ina Garten make some on Barefoot Contessa one day though and they looked great. Its got really good reviews! I hope that helps you. I’m going to have to get this cookbook because I keep finding amazing recipes from it! These lok lovely and moist! I make about two batches of muffins a week, so I’ll include these in the rotation. Definitely get it! I got mine off Amazon because it was a few bucks cheaper then at Barnes and Nobles and shipping was free! 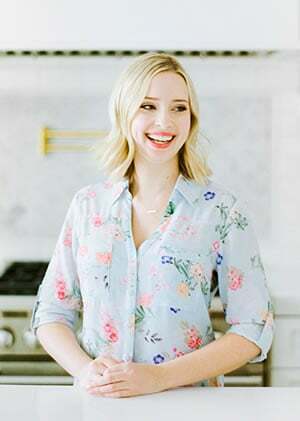 All the recipes are delicious that I’ve tried and there’s a lot of unique ideas. That's great!! I'm happy to hear that 🙂 Hahah guy's taste preferences never cease to surprise me. This sounds like a real tastey combination. I like it! Cranberries are a major commercial crop in certain American states and Canadian provinces (see cultivation and uses below). Most cranberries are processed into products such as juice, sauce, jam, and sweetened dried cranberries, with the remainder sold fresh to consumers. Cranberry sauce is regarded as an indispensable part of traditional American and Canadian Thanksgiving menus and some European winter festivals.,. These muffins are fantastic!! Thank you for the recipe. I love the espresso powder – it takes “banana muffin” to a whole new level! I can’t wait to try this recipe. They look amazing. I’m always trying new recipes and taking them to work. Hi Tessa. Just happened upon your blog. Completely mouthwatering. I’m such a fan of muffins, especially when banana and chocolate is involved. Love the coffee flavour! Definitely going to give these a try. Thanks for the recipe. I just found your recipe through Pinterest. The muffins look delicious. I was wondering if these could be made without the espresso or coffee substitute. I’m not a coffee drinker, so I just thought I would ask if you thought they would still taste ok. I’ll have to check out the rest of your site. Thanks. As soon as I saw these I knew I had to try! Just made it and I was not wrong, mine turned out really moist and the coffee flavor made it extra special. Thanks for sharing! Hi! I made these today and am in love! Only issue I have is I can’t taste the espresso at all. I even added extra! Any suggestions? Is your espresso powder fresh? I find it loses flavor the longer the package has been opened. What brand are you using? Tessa – these are amazing! Tonight will be the third time I am baking them. I was wondering – did you ever put a frosting on top? Maybe a cream cheese frosting? I haven’t but cream cheese sounds delish! Espresso powder? Can I just have my local coffee shop grind me up some beans really fine? Thank you for sharing your recipe. I was wondering if there was some way to cut the sugar since bananas are naturally sugary. If so what sugar can be cut? THESE ARE AMAZING! I made them this afternoon and they came out perfect!!! I highly recommend these. I used PaperChef parchment baking cups (no need to spray/grease anything). I will be making them again soon! In the instructions it says to spray the pan with non-stick cooking spray but does not mention paper liners. In the pictures you have used paper liners. Do we need to spray if liners are used? apologies. I just noticed the comment directly above my question. Not a big fan of bananas but had to use up some bananas so I gave this a try today and they are super delicious! Extremely moist and Melt in your mouth, especially when they are warmed up. Looking forward to trying out the chocolate chip muffin recipe. These sound so delicious, coffee and choc are both faves! Hi, I wished to make this but I have only wheat flour at home.. Is it possible that I use wheat flour in place of all purpose flour.. Would you recommend that? I think that would be okay here! 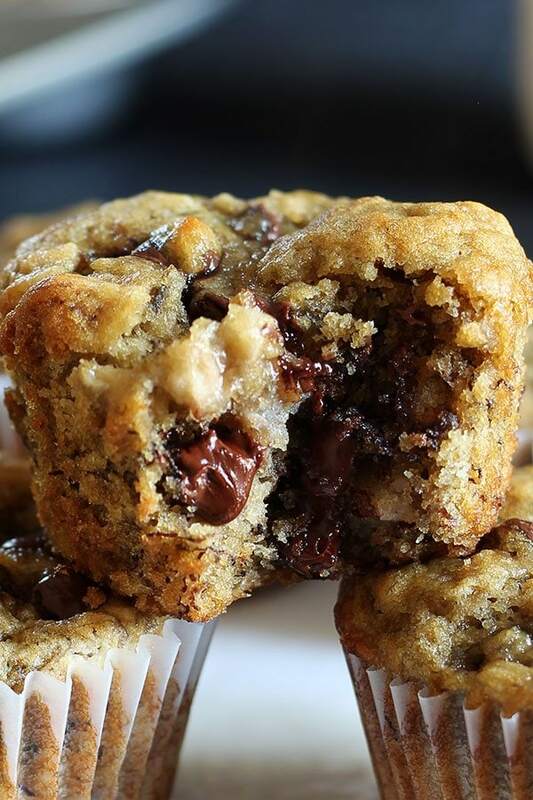 In the picture, your Expresso Banana Chocolate Muffins look very moist, and the expresso makes it sound like their will be a hint of coffee flavor. Mine did not turn out very moist. They were somewhat moist, I couldn’t taste any coffee at all, and I used Medaglia D’oro instant expresso coffee. I was disappointed because I had intended to sell them at an arts & crafts fair. I should’ve added walnuts,too. Pingback: Muffin Recipes Perfect for Breakfast. Be The Morning Superhero!